If you had asked me two years ago how I felt about my lines and wrinkles, I would have told you I embrace them, they are part of me, they show I laugh a lot blah, blah, blah….Fast forward to the ripe ole age of 42 and whilst I still feel a little like that, I certainly look a lot more weathered and “Lived” in. Having done lots of research recently on aesthetic procedures and still unsure as to whether they are for me, I was delighted to be asked to trial the NEWA Facial Skin Contouring and Tightening system. The NEWA handheld device is the most advanced home-use skin tightening tool available – you won’t get a more effective treatment outside of a skin clinic. NEWA is clinically proven to stimulate your skins biological processes for natural rejuvenation, rebuilding collagen and reducing wrinkles, leaving skin firmer, tighter and more radiant. The NEWA is powered by state of the art ‘3DEEP’ RF technology that is used by leading dermatologists in professional clinic’s around the world. NEWA slows down and counteracts the skin ageing process by stimulating the renewal of collagen, reducing fine lines and wrinkles and improving skin tone and texture. Clinically proven to reduce wrinkles by an average of 36%, you can achieve immediate visible results and long term wrinkle reduction, lifting and contouring. Now I need me some of that! You see, for me, the main concern is slackening skin that makes me look so sad! I am not entirely vain but I look more tired than I actually feel. Knowing that there is a device that can help with all of this and can be used in the comfort of my own home, really excited me. We all lead busy lives and trips to and from a clinic for regular procedures are not something I can manage. However, 24 minutes a day 3-5 times per week is most definitely possible. In the box – You will receive your incredibly lightweight device. It looks really stylish too with a beautiful pearlised finish. You will also receive a 130ml tube of the LIFT Activator Gel which you apply every time you use your NEWA. You also receive your power supply, storage bag, user manual and a quick user guide. The manual is precise and clear and very easy to understand. You can use your NEWA any time you like, but i prefer to use mine of an evening as it is time for me to relax and focus on myself. For the first 1-4 weeks best results will be achieved by using your device 3-5 times per week then from week 5 on-wards you can drop down to twice per week. Whilst this may help with lines and wrinkles, the six areas that you can work on are two areas on your cheeks and under your chin area, (both sides of the face) leaning more towards a contouring, tightening and smoothing effect. After removing all jewellery from any area to be treated and having cleansed your skin and removed all trace of dirt and make up, you then apply two lines of the Activator Gel directly onto the Electrodes on the device. Place the tip of the NEWA onto the treatment area of your face and spread the Activator Gel from the centre out to the borders of the area. Only after you have done this step can you switch on mode 2 on the device and press the power button on the top to start the energy delivery. The tip must be in full contact with your skin at all times. Treat your chosen area in circular movements at all times. What you will feel is a pleasant and relaxing warm sensation. Once it has reached the optimal temperature the LED light will turn green so continue the treatment. Each area will take four minutes to treat meaning the complete treatment will take just 24 minutes. Mode 2 is the highest treatment but if this feels too much you can easily switch down to mode 1. When the four minutes is up the LED will stop blinking and you will feel a vibration alert letting you know that area is done. I find the treatment really pleasant and relaxing and the time goes so fast. You see results immediately, as i noticed my face looked much more rested and relaxed and over a month period i really noticed some lifting and a more contoured structure. The thing that surprised me the most though, was how smooth my skin became!! The texture of my skin was so much nicer and that is something i am always battling with, when using my skincare. Now my skincare goes on better, my make up applies smoother and i look much fresher and more youthful. 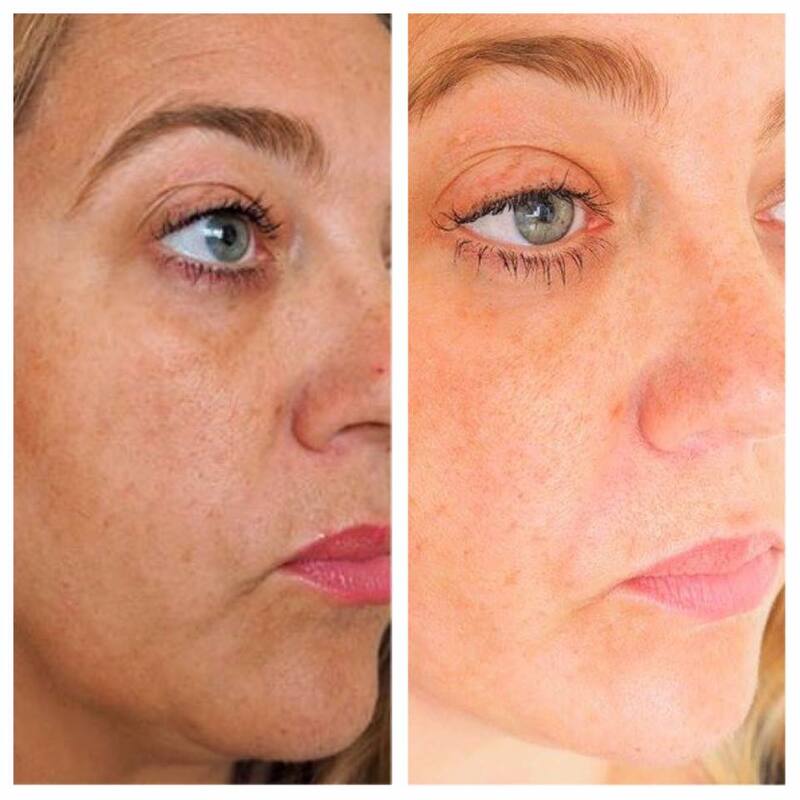 If you are looking at your skin, at a loss as to what else to try, and are really struggling with that sagging look, i would highly recommend this system. As you can see from my above before and after photo, after 4 weeks I have seen some slight improvement in my nose to mouth lines, the sad line by my lip and under my jaw line. I have also seen improvement in the tone and clarity of my skin. It really is a wonderful, at home beauty treatment that is incredibly easy to use and achieves great results. Whether you want to reduce the signs of ageing or hold wrinkles at bay, this is the ultimate beauty tool for a younger looking you! NEWA is the only FDA cleared home-use radio frequency device. You can purchase the NEWA Sytem at NEWA Beauty. This post has been sponsored by NEWA BEAUTY however, as always, all opinions are my own. Please read my disclaimer on my WORK WITH ME page, for more information. "Elemis launch Pro Collagen Marine Oil – Exclusive Try Me Collection"
"Bio-Extracts Launch the Advanced Eye Contour Collection"
Sounds interesting – I've used at-home laser and LED light therapy, I love my beauty gadgets! Me too, especially when you get great results! I'd never heard of this brand before but I love using new beauty gadgets. This sounds like a good product for at home! Thank you, i'm thrilled with the results so far! Thank you, thrilled with it so far!